All year I’ve been thinking that I am 57 years old, so it came as a bit of a jolt to realize that I am actually 58, and my pies still look like a child made them. I am an adult woman, well into the second half. I need to step up my pie game. So this is the first in a series of pies I will bake on my way to casual competence. 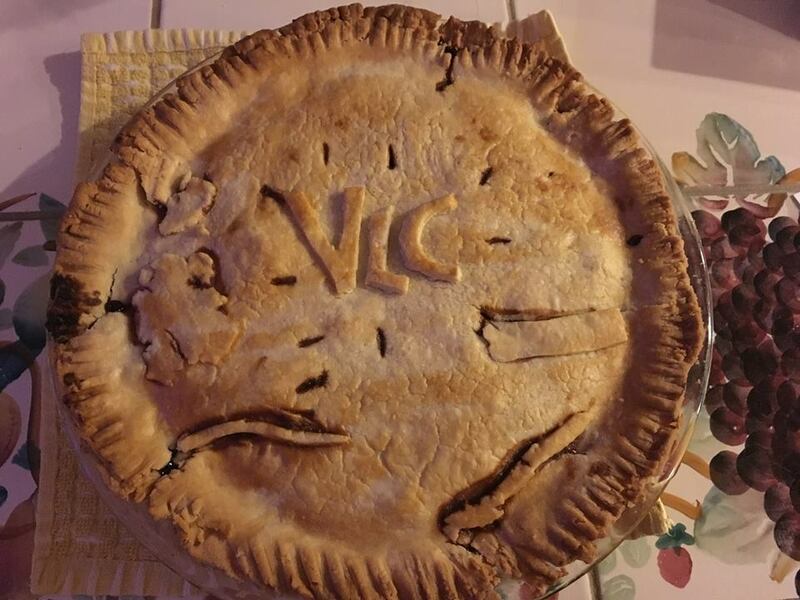 This was a gift pie I baked for my sister, VLC — Vicki Lee Coleman. I baked it on the day after Christmas, and somehow, we got into a fight that was triggered by a small thing (“please don’t take my picture when I’m eating dinner”) but ended up being about every thoughtless moment and every stupid thing I’ve done over the last four or five decades. (She said she had a long list.) My sister may not know where she put her car keys, but she does know that I did not call her that one time in 1999, and she may fling that oversight at me at any time. This pie was created in peace and as it cooled, we raged. We were too upset to eat dinner together, but over the course of the next hour or two, we eased ourselves to detente, and then sat down and had pie. My mind and emotions were whirling from the argument, but that first bite of pie with vanilla ice cream settled me into a sweet and lovely moment. The warm berries and flaky crust called me back to my body, and it felt good. I screwed around with this recipe, which calls for 9 tablespoons of fat — 4 butter and 5 shortening, and the other way around works also. Higher butter content yields one thing; more shortening, another. I have read this; I do not have direct experience or knowledge. I doubled the recipe to make top and bottom crusts, and because butter comes in 8 tablespoon sticks, I said to myself, OK, I need 16 tablespoons: 1 stick of butter and 8 tablespoons of shortening — I may have mathematically shorted the pastry 2 TBSPs of fat, I don’t think I did in actuality. Cold shortening in a measuring spoon is mountainous. The flavor and texture of the pie crust was delicious (I love a dry, flaky crust), but the dough did tear during rolling, and I had to patch it in several places. About 15 minutes into baking, I applied a simple egg wash to try and shine up the top. I was envisioning a browner, glossier pie. So: Would a little more fat make the crust more elastic (and therefore less likely to tear)? Is there something wrong with my rolling technique? Why is the color uneven? Why isn’t the pie a bit more shiny? Preparing the filling was a snap, and the pie held its shape after cutting. The filling didn’t run out all over the pie pan. I consulted a basic Food Network recipe for Cherry Pie, and here’s what I actually did: 2 cups frozen organic cherries, 1 cup frozen blackberries, 1 cup tart cherries, soaked in warm water and drained, all in the saucepan. Whisked 1.5 cups of sugar and 4 TBSP cornstarch together, and added this dry mixture to the fruit in the saucepan, little by little. I ladled the filling into the pie crust with a slotted spoon, and ended up with about 6 ounces of leftover cherry-berry syrup, which I am saving for oatmeal or ice cream. I did not overfill the bottom crust — there was still a bit of headspace when it was all said and done, and the top crust settled down nicely over the warm fruit. As it was going into the oven, Maddy asked, “Did you put any herbs in there?” That is an interesting question, isn’t it? What would go well? Minced fresh basil? Mint? Something lemony? Next, I am going savory: Pie Two: Kale and Spinach Hand Pies for New Year’s Eve dinner. And for New Year’s Day, Maddy’s favorite and a fitting way to begin the new year: Chicken Pot Pie.